The premier global provider of embedded barcode scanners and imagers for clinical diagnostics applications, Microscan has 30+ years experience in both Auto ID and machine vision technologies. Known for its compact, high precision products, Microscan will display fixed mount and handheld barcode readers for 1D and 2D barcodes, as well as machine vision systems for automated inspection applications. Both products can now be used with interchangeable lenses to address more application needs, such as high magnification and wide fields of view. Microscan has introduced a new C-Mount lens configuration for two of its products: the popular QX HAWK imager and the Vision HAWK smart camera. The QX HAWK barcode imager is ideal for industrial track and trace applications, with powerful algorithms for reading virtually all linear and 2D barcodes. The rugged Vision HAWK combines this decode capability with a complete vision toolset to enable a broad range of inspection and identification tasks. Both products can now be used with interchangeable lenses to address more application needs, such as high magnification and wide fields of view. As the world’s smallest fully-integrated vision system, Microscan’s ultra-compact Vision MINI is designed for reliable vision performance in embedded clinical and lab automation applications. 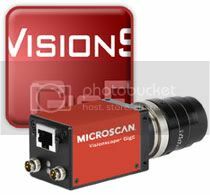 Microscan announces the new Vision MINI smart camera. As the world’s smallest fully-integrated vision system, the ultra-compact Vision MINI is designed for reliable vision performance in embedded clinical and laboratory automation applications. Original equipment manufacturers in clinical diagnostics and other life sciences are turning to machine vision to increase throughput and improve the accuracy of their instruments. Auto ID systems such as barcode readers have long been used for sample tracking and identification; the Vision MINI machine vision system takes this capability a step further by automating critical inspection tasks such as cap presence, color matching, and test tube identification in addition to reading 1D and 2D barcodes. Microscan announces a new three megapixel resolution configuration in the popular MINI Hawk series of compact direct part mark (DPM) imagers. The powerful new three megapixel MINI Hawk is the smallest and highest performance autofocus imager in its class for reading small DPM marks straight out of the box. This MINI Hawk is specifically designed for reading small 2D direct part marks widely used in medical device and electronics manufacturing industries. Electronic components such as printed circuit boards (PCBs) typically have very little space to add barcodes for traceability. Small 2D Data Matrix codes are ideal for this type of application; however they require a product with enhanced DPM reading capabilities to capture this critical data. The fully integrated design of the MINI Hawk makes it easy for electronics and other manufacturers and their suppliers to read these codes. Also available in high speed and high resolution configurations, the imager can also consistently read symbols that are damaged, distorted or otherwise challenging due to direct part marking. Microscan has announced successful results from the recent Automotive Components Shanghai show. During the show, Microscan demonstrated their diverse line of barcode and machine vision products for automotive parts traceability and error proofing processes, including the latest 2D barcode imagers optimized for reading direct part marks. The Automotive Components exhibition featured suppliers of products such as engine parts, electrical equipment, fuel systems, cooling systems, engine-driven compressors, fans, air conditioners, suspension members, tires, and chassis. At the exhibition, Microscan demonstrated their barcode scanners and 2D barcode imagers, machine vision software, smart cameras, and machine vision lighting. Local interest in Microscan’s product line was very strong, especially among suppliers recognizing the growing demand for barcode traceability of automotive parts. Of particular interest were Microscan’s QX Hawk and Mobile Hawk imagers, which are optimized to read challenging 2D direct part marks such as Data Matrix. Permanently marked Data Matrix codes are becoming more commonplace to identify and trace components used in automotive and aerospace manufacturing. Microscan, a global technology leader for precision data acquisition and control solutions, premiers the QX Hawk, the world’s first barcode imager to be fully integrated with liquid lens technology, enabling infinite focus flexibility. The QX Hawk imager easily reads any barcode or 2D symbol, including challenging 2D direct part marks (DPM), within seconds of installation. With the introduction of the QX Hawk fixed-mount imager, Microscan now has the largest product line available of specialty imagers and verifiers focused on direct part mark reading. The revolutionary QX Hawk is the first high performance imager to have the full flexibility to read any mark at any distance and speed in any environment, and the first to fully integrate liquid lens technology. Advanced imaging technology, including liquid lens autofocus and modular zoom optics, removes the need for automation engineers to research multiple configuration options before deployment. Microscan, a global technology leader for precision data acquisition and control solutions, introduces the new point-and-shoot Mobile Hawk handheld imager which quickly reads any 2D barcode, including direct part marks (DPM). The Mobile Hawk DPM imager expands Microscan’s specialty product line of imagers and verifiers focused on challenging, low contrast direct part mark applications. Direct part marks are typically 2D Data Matrix symbols permanently marked by methods such as dot peen or laser/chemical etch onto substrates including metal, plastic, rubber or glass. These marking methods often result in low contrast visibility of the symbol or inconsistent imprints that can be challenging to decode through traditional imaging technology. Using advanced technology, the Mobile Hawk combines patent-pending MAXlite machine vision illumination with aggressive X-Mode DPM algorithms. MAXlite leverages NERLITE® experience in machine vision lighting with an integrated, optimized multi-axis lighting solution. These exclusive Microscan lighting and algorithm technologies combine to deliver a truly plug-and-play mobile imager that is easy to use and extremely reliable for low-contrast DPM applications. ControlDesign.com has an exclusive preview of Microscan‘s upcoming QX Hawk designed for high performance direct park mark reading. Selection of a proper code reader is critical to a track-and-trace system’s successful implementation. Microscan says its new QX Hawk is the first high-performance reader with the flexibility to read any mark at any distance and speed in any environment. 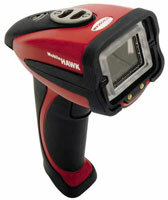 Microscan will be introducing the QX HAWK, at the Assembly Technology Expo in Chicago on September 21-22, 2009. From an economical single-camera system to a sophisticated eight-camera configuration, Microscan’s Visionscape GigE platform contains all the necessary components for a complete machine-vision implementation. PC-based Gigabit Ethernet systems leverage standard network components, such as cabling, switches, and interface cards, while Visionscape software allows rapid deployment of your machine-vision application. Visionscape GigE works with a full set of Microscan GigE cameras and can be used in applications for precise inspection, identification, guidance, gauging, and measurement. It decodes all standard linear barcodes, 2-D symbols, and stacked symbologies. Minimum PC requirements for Visionscape GigE software include a Pentium P4 class processor (2.4 GHz or higher), Windows XP or Vista, at least 1 Gbyte of RAM, an XGA display, and one open PCIe slot for a network interface card. Microscan has expanded its barcode product line to include value level handheld readers for standard barcode applications. They now offer handheld barcode readers for all applications, ranging from easy linear barcodes up to challenging 2D direct part marks. The introduction of the Microscan HS-1 and Microscan HS-2D expands Microscan’s value level product offering for standard applications, complementing its existing line of specialty handheld barcode imagers designed for more challenging applications such as 2D direct part mark reading. The readers provide a notable out-of-box, plug and play experience. The easy to use barcode output can plug directly into standard Microsoft Office programs, such as Word or Excel. With the introduction of the handheld readers, Microscan becomes a one-stop shop for all barcode reading needs. As an additional user benefit, the new value level readers offer a low-cost entry point solution for barcode and 2D barcode applications. The HS-1 is a value level handheld linear CCD reader for reliable decode of linear barcodes in common applications such as printed black and white labels. Providing fast and accurate performance with minimal budget impact, the HS-1 is ergonomically designed for comfort and built to withstand multiple drops in harsh industrial environments. The HS-2D imager is ideal for any high-contrast automated data application from clean rooms to industrial environments. The HS-2D is a value level portable solution for decoding both linear barcodes and 2D symbols in common applications such as high-contrast black and white labels. It reads symbols in any orientation, includes a built-in dual LED targeting system for quick and easy data capture, and is designed to withstand rugged industrial environments.